I like my personal space. I don't like it when someone I don't know sits in the chair right next to me at church. I don't like when someone stands too close to me in line. And since my kids are an extension of me, I didn't like it when strangers would touch my babies. And I still don't like it when kids I don't know touch my girls when we are at the park, at school, etc. And when someone I don't know very well asked me if I wanted to hold her baby the other day, I didn't want to be rude so I held that baby. But I didn't want to. I'm just not a touchy-feely in-your-space kind of gal. So I'm sure you could guess I'm not a big hugger. I rarely hug people the first time I meet them. I even have relatives I am not entirely comfortable hugging. When it comes to the runnerd in me, I am all about hugging. It's funny how running can bring you together. Whether it's snuggling together for a photo in front of the port-a-potties before a marathon or sweaty hugs and group photos after a half marathon, I never hesitate to get or give a hug. 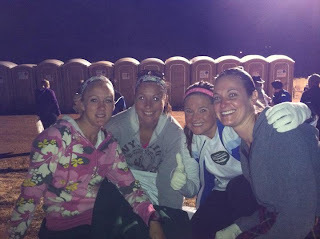 At first I tried to blame it on the runner's high dulling my personal space senses, but the port-a-potty photo BEFORE the race is proof against that theory. The truth is there is something about running that connects us. Running isn't just something we do to burn calories or stay fit. For RUNNERS, there is emotion connected to running. And it is that emotion that comes out when I feel that urge to hug a runner I know - or sometimes even just recognize from the bloggy world. So if you ever see me at a race, you better watch out. There might be a sweaty hug coming your way. Have you hugged a runner lately? I'm not a hugger either! That said - I get very emotional at races so there's always a little hugging and a little crying at the end! I am super uncomfortable when people touch me, even with family sometimes. 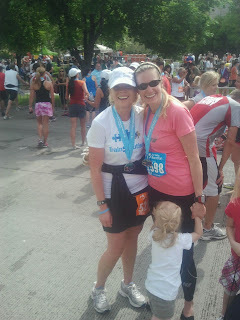 I can't say that I've noticed a difference at short races, but after the marathon I could have hugged ANYONE. I was so happy it was like I was on drugs :). I think running does bring out the hug in all of us. 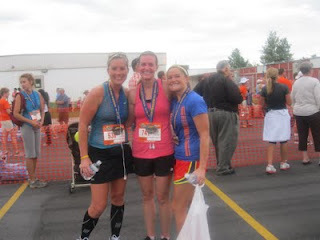 I have hugged people after races that I would hardly talk to outside of running. Love hugging my running girls! I'm with you on this...I'm not a very touchy feely person. But, with running, it IS different! Great insight on this topic! Oh my...this is SO me. My hubs comes from a huge huggy family and it is just so not me and uncomfy. And yet with my run buds we are all about the hugs and high fives. Maybe because we all know what we go through in training! I could not agree more with this. I am the exact same as you....totally not touchy feely at all! Infact I can't stand it when people I barely know hug me....so awkward! But I totally agree about the running connection. I will hug just about any sweaty runner after a race, before a race, even during the race at UVM. How strange....I may be thinking about this the rest of the day. ha ha! I need another Candice hug. Now where do I have to run to get one? Yay! That's our PR hug. Great day! totally feel ya on the personal space thing...and ABSOLUTELY feel ya on the running connection thing.